"Crime of the Century "
The Lindbergh baby case is considered to be one of the most popular missing person cases of all time. 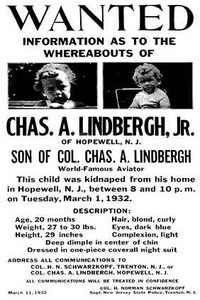 Charles Lindbergh Jr. was just one month away from his second birthday when he was abducted from his nursery on the 1st day of March in the year of 1932. The first person to notice that the Lindbergh baby was missing was the nurse that cared for the physical health of the baby. Her name was Betty Gow. Upon investigation of the nursery, a note demanding ransom in the amount of fifty thousand dollars was identified on the sill of the window next to where baby Charles Lindbergh Jr. slept. This was just the first of many events to occur in the case of the Lindbergh kidnapping. The law enforcement officials from the New Jersey State Police arrived at the scene of the Lindbergh kidnapping in order to conduct an investigation of the events that took place that led to the point which the child was discovered missing and to identify and collect any possible evidence that would assist them in solving the case and locating baby Charles Lindbergh Junior. They were unable to locate any fingerprints or blood, but they were able to identify footprints on the floor that were made possible by mud, as well as a ladder that was used during the commission of the crime. Despite the fact that numerous leads were received and several tips were shared with the law enforcement personnel working the investigation on the Lindbergh baby, no news was heard for five very long days. It was then that the father of the baby, Colonel Charles Lindbergh, received an additional note demanding ransom on his son. This particular note increased from the original fifty thousand dollars to a whooping seventy thousand dollars. Between the 6th day of March and the 12th day of March, three additional ransom notes were received by various means. The last indicated that another note would be located near a subway. A man who was assisting in the case of the Lindbergh kidnapping, Dr. Condon discovered this note. This last ransom note regarding the Lindbergh kidnapping was especially important. It placed Dr. Condon in the midst of a meeting with a man who identified himself only as “John” in the cemetery known as “Woodlawn Cemetery”. The two men discussed the situation as well as the ransom requests. The mysterious “John” made a commitment to provide some type of object that would confirm the identity of Charles Lindbergh Jr. so that payment arrangements could be made. Dr. Condon agreed and showed a great deal of enthusiasm in taking care of the ransom to the individual. On the 16th day of March, the doctor received yet another ransom note and a baby sleeping suit that was intended to identify the Lindbergh baby. On the 21st day of March, the doctor received another note stating that he must comply and revealing the fact that the Lindbergh kidnapping had been in the works for over a year. By the 30th day of March, another note was received stating that the ransom would be increased to one hundred thousand dollars. On the 1st day of April, the doctor received instructions that the money should be ready by the night of the 2nd. That day, the doctor was provided another note that was issued to him by a taxi driver. From the instructions contained in that note, he found the one that was identified as the twelfth under a rock found in front of a greenhouse in the Bronx. Shortly thereafter, the doctor met with the man that identified himself as “John” and tried to reduce the ransom to fifty thousand – as stated in the original ransom note. The thirteenth note received by Dr. Condon gave specific instructions pertaining to the location of the Lindbergh baby. Charles Lindbergh Jr. would be placed on a boat that would be near the region known as Martha’s Vineyard, which is located in the State of Massachusetts. The boat in which the child was supposed to be placed on was named “Nellie”. However, the search for the Lindbergh baby was unsuccessful. Over a month later, the search for the Lindbergh kidnapping baby came to a halt as he was discovered on the 12th day of May just four miles from the home where he was abducted. The Lindbergh baby had been murdered and was partly buried. 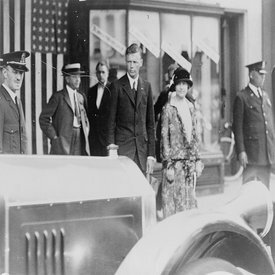 Identification was successful of the child and Charles Lindbergh Jr. was cremated on the 13th day of May, 1932. The investigation continued in an effort to locate the individual that performed the Lindbergh kidnapping and the murderer of little Charles Lindbergh Jr. so that justice could be served. Many banks and other individuals were informed to watch for individuals that passed gold notes. On the 19th day of September, an individual that fit description of the male identified as “John” throughout the case was taken into custody. The man’s name was Bruno Richard Hauptmann. On the 26th day of September in the year of 1924, he was indicted for extortion. On October 8th, he was found guilty of murder. He faced a trial on the charges and was issued a full conviction on the 13th day of February in the year of 1935. On the 3rd day of April in the year of 1936, justice was finally served in the Lindbergh baby case as Bruno Hauptmann was electrocuted for his vicious crime against little Charles Lindbergh Jr. and the emotional havoc he caused with the Lindbergh kidnapping.